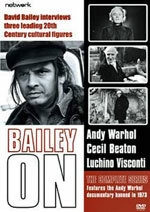 Three documentaries commissioned for ITV between 1968 and 1973, directed by David Bailey and collectively titled Bailey On… will be released for the first time on DVD on 10th April 2006. With his standing among the artistic community, Bailey was given unprecedented access to his subjects – photographer Cecil Beaton, Italian film director Luchino Visconti and pop art legend Andy Warhol. The Warhol documentary was infamously banned by the Appeal Court when a complaint was lodged about its content by Record Breakers host Ross McWhirter, on the grounds that it was offensive and indecent. It took two months to get the programme shown. The three films also contain cameo appearances from the movers and shakers of the 60s and 70s including Mick Jagger, David Hockney, Lord Lichfield, Brian Duffey, Twiggy, Penelope Tree and Helmut Berger. As well as the documentaries, the DVDs will also feature a new, half hour interview titled Bailey on Bailey, with David Bailey talking to journalist Chris Roberts about the making of all three documentaries. There will also be a free booklet of the originally designed transcripts for Bailey on Andy Warhol. Expect a review on this site in the very near future.